The Angler fish is celebrating 'Earth Hour'. Are you? The Earth Hour is an annual event held towards the end of march in which businesses and households switch off all non-essential electrical appliances to raise awareness about climate change. It was conceived by Leo Burnett and the WWF, starting in 2007 in Sydney with the participation of 2.2 million people. 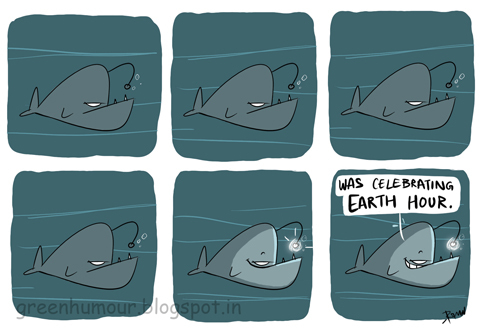 If Earth Hour is celebrated underwater, the Anglerfish is sure to take the lead!